The JTAG standard contains definitions for various different types boundary scan cells, each of which have different capabilities, and these allow an IC vendor to accurately describe how the pins on their chips behave. But because not every eventuality can be foreseen the JTAG specification also allows IC vendors to create their own types of boundary scan cells. When IC vendors do this they have place the definition of their cell’s behaviour in a file called a package file, A package file can contain the one or more cell definitions. The IC vendor will make the package file available with the BSDL file. If you are using XJDeveloper and you select a BSDL file which relies on one of these custom cell definitions for one of your JTAG devices, you will get an error message saying that there is a missing cell definition. 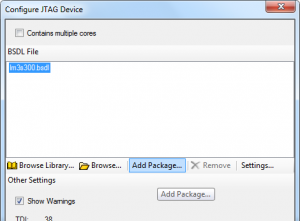 You can solve the problem by adding the package file to your project: select the BSDL file that requires the package file in the JTAG Devices list on the JTAG chain screen. Click the Configure button to open the Configure JTAG Device dialog. Then select the BSDL file name in the dialog, click the “Add Package” button and then navigate to the package file that the IC vendor provided. More detailed information about custom cell types can be found in XJTAG’s Technical Guide to JTAG in the section about non-standard cell types.